Gadus Morhua Codfish in oil, served with sweet and sour sauce made with Dutch rhubarb, onion of Montoro, Ribera oranges and raspberry vinegar, flavored with Melissa. The light acidity of French rhubarb, the sweetness of Sicilian oranges, and the minty flavor of melissa –almost hinting to the sweetness of vanilla– embrace one another harmoniously in a marriage of love and sensations, in this delightful dish of codifsh Gadus Morhua style. 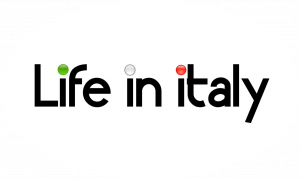 This is a dish that brings within the flavors and the colors of Europe: from the cold waters of Iceland, through the green transalpine forests of the French Alps, it finally reaches completion and full taste in the deep South of Sicily. A main course where three, main elements fit deliciously and beautifully together, in a layered game of sensations which is hardly equalled by other dishes. First of all, see to the cooking of the cod. Take a medium sized glass jar hermetically sealed with a metal clip, place the small pieces of codfish, and pour in the oil until the fish is completely covered. Add the raw “date sized” tomatoes, black olives and the capers cleaned of their excess of salt. Top with pepper, chili pepper, a few leaves of fresh melissa, and a little Maldon salt. The cod is then cooked "Sicilian style:" the jar is sealed and placed in a pot full of water, which is then put in the oven, at a temperature that never runs higher than 60 degrees, for at least an hour. Temperature and time are essential: the fish, although immerse in oil, must not fry, yet, be fully cooked. Once it is, don’t open the jar until it has cooled down a bit. By getting colder, the oil will exalt the taste of the fish, which will also be emphasized by the perfect balance reached by the spices and other ingredients, all concurring to exalt the extraordinary taste of the cod. When finally getting ready to dish the fish, do not throw this fantastically aromatic oil out: keep it to create a delicious dressing or dipping sauce. Whilst the fish is cooking, you can focus on the preparation of the Dutch sweet and sour rhubarb sauce. Cut the rhubarb into small pieces, leaving its characteristic red skin intact, then place it into a pan with the onion, a drop of raspberry vinegar, a little sugar, the pulp and juice of the oranges, salt, pepper and, if desired, a little chili. Simmer on a low heat until the rhubarb is tender. 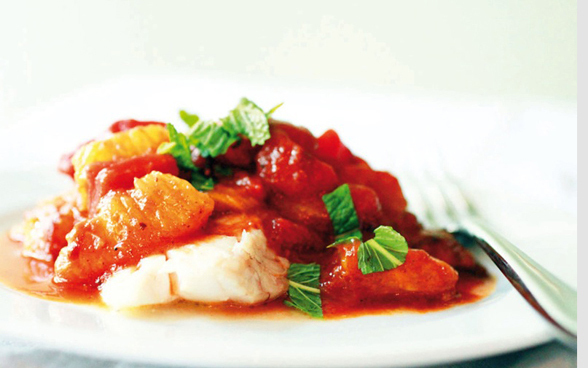 Once the cod is ready, dish it out and serve it with a spoonful of the rhubarb sauce on top. Perfect side dishes for our cod Gadus Morhua are potatoes roasted with olive oil, sea salt and fresh rosemary or simple, wilted greens. Place the codfish in the middle of a plate, with a drop of the cooking oil. 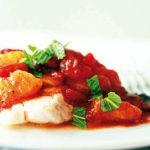 Spoon the sauce over the fish and decorate with pieces of orange and fresh basil and melissa.